Exhibition furniture; its probably something not many people think about, that is until you’re forced to. And even then, many of you end up with the same uninspired high bar and chairs – (that’s a gorgeous high bar, said nobody ever) – either because it is easy or because it is all that you know. The good news is, you don’t have to have 『exhibition’ furniture at your next trade show, there is a whole world of furniture options that will help transform your next event from drab to fab. Selecting the right furniture can have a real impact on the overall look and success of your exhibition stand. Yes, the furniture you select needs to be functional, but it also needs to look good too. Don’t just choose a chair because you need somewhere for your customers to sit; but rather choose a chair that looks inviting (makes people want to sit on it), piques interest, and/or matches your company branding/corporate colours. Is memorable and has everyone talking (for the right reasons). Why blend in when you were born to stand out? Elevates your brand, makes your company look more professional and instils confidence in your customers. Furniture when done right, will give you maximum impact and exposure for very little time, effort and money. At Outstanding Displays, we pride ourselves on delighting our clients by incorporating unique, cutting edge furniture into all our designs. 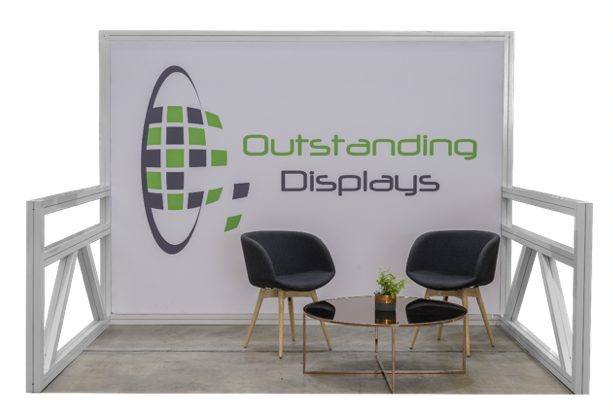 We work with our clients to create an exhibition space that not only is functional but also looks amazing and draws your potential customers in. Choose the right chair, to put dollars in the bank.